Apollotek specialises in the design and manufacture of Flight Test Instrumentation, Aerospace Telemetry Products, Systems and Solutions including Video and Data Link products. We have developed a unique range of USB Powered, small sized but high performance Signal Recovery products which communicate with a host computer over a USB Bus port. 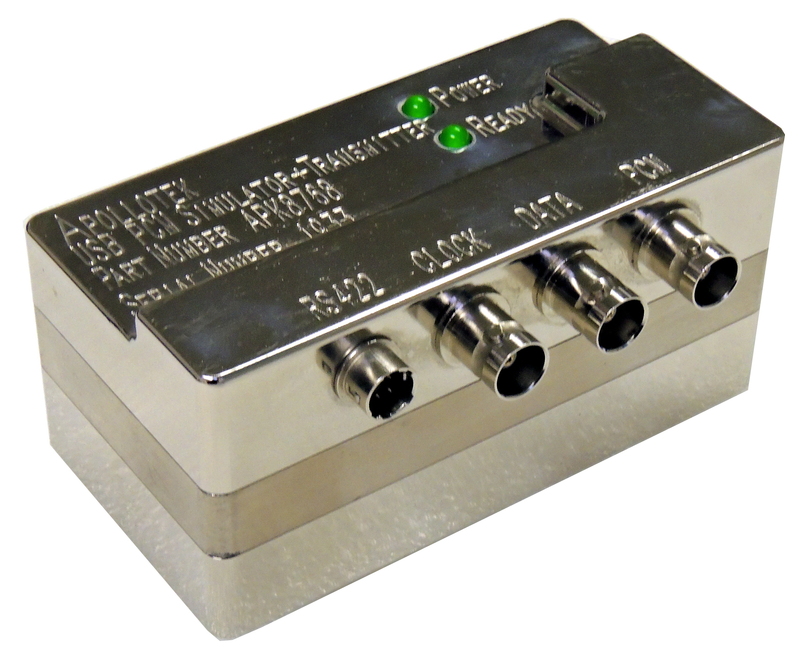 The Apollotek USB product range includes Receivers, Bit Synchronisers, Decommutators and Simulators which are available as single function modules or as combined function modules. Our ApolloDas 8600 Modular and extremely rugged Airborne PCM Encoder System provides a family of Data Acquisition Modules which can be configured into single chassis or multiple chassis configurations. Application Specific packaged systems are also available from Apollotek. The Apollotek GDSmate Telemetry Environment Software package provides real time graphical data displays and is also used to set up the Apollotek range of Telemetry Receiver and Singal Recovery products. GDSmate is scaleable from single stream laptop configurations through to multiple simultaneous stream Flight Test Data Centre applications running on multiple servers. Apollotek also represents leading USA Aerospace Instrumentation organisations which include the Delta Information Systems Group comprising Delta Digital Video, GDP Space Systems, Acroamatics and Ampex Data Systems. We also represent the SEMCO range of high performance Telemetry and Surveillance radio receivers. 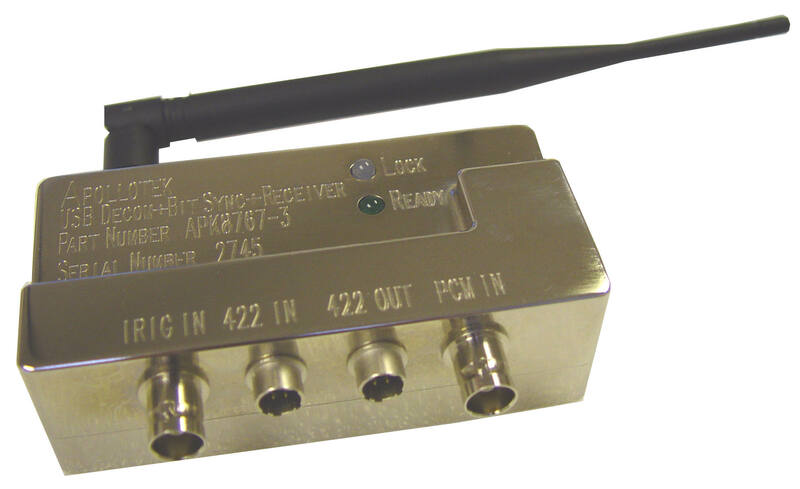 Apollotek also provides turnkey Telemetry Instrumentation Systems incorporating its own products and other appropriate third party products which are integrated and tested in-house before delivery. Please visit the other pages of this site where you will find more details of the Apollotek product range and those of our Partners. If you cannot see what you are looking for please send us a message at info@apollotek.co.uk or contact us to find your local Apollotek Representative. GDSmate Telemetry Environment Software to set-up and control Apollotek products and to provide easy to configure Real Time Graphical and Tabular displays together with Data Archiving, Data Replay and Data Export capabilities. We have also developed a series of Analogue and Digital high speed Telemetry and Surveillance data recorders which integrate our USB products into a PC chassis with high speed disk arrays and which can be remotely controlled. Please visit our Product Information pages and Data Sheet Pages for more detailed information and please visit the websites of our Delta Information Systems and SEMCO partners and checkout their industry leading products. You can Download and save the current Apollotek standard Products Catalogue here. Thank you for visiting the Apollotek Website. Please come back soon. The Model APK8767 is a USB Powered L-Band and S-Band PCM/FM and SOQPSK-TG Telemetry Receiver with an integrated Bit Synchroniser and Decommutator. The APK8767 can also be operated as a Receiver and Bit Synchroniser, as a Bit Synchroniser and Decommutator, as a Bit Synchroniser and just as a Decommutator - a miniature Telemetry Groundstation and Flight Line Checkout System. The APK8768 is a small USB Powered and USB Set-Up multi-RF Band PCM and SOQPSK-TG Dynamic Parameter Telemetry Data Simulator. IRIG 106 Frame Formats can be programmed and dynamic parameters can be created and transmitted by the internal nominal 10 mW transmitter which can operate from L-Band through to C-Band up to 6 GHz. The unit also provides user programmable RF atenuation up to 60dB. The unit can also contain a USB rechargeable battery which enables fully autonomous operation as a self contained Telemetry Sender.